Gives to our bodies the tips of wings. Of course, as a photographer, I would replace "draw" with "photograph" - though I should remember that "to photograph" means to draw with light! I might also replace "bodies" with "mind" or "soul." That done, I love the sense of the phrase "photographing the idea of a beautiful thing." The photograph captures a moment in time and translates the 3D world into 2 dimensions. If I have done my job right, the photograph (or even better, the print) is the "idea", and a viewer of the photo can, through the image, experience some of the beauty of the thing. If a photo is good enough that I make it into a print, seeing it can transport me back to that moment, I can remember what came before and after, and I can "see" the dimension that the camera seemingly took away. My goal is for you the viewer to have your own sense of time and place around that image, carried there as if on the "tips of wings." Not every photograph is of a "beautiful" thing. Some photos are documentary or curious or puzzling or stark. 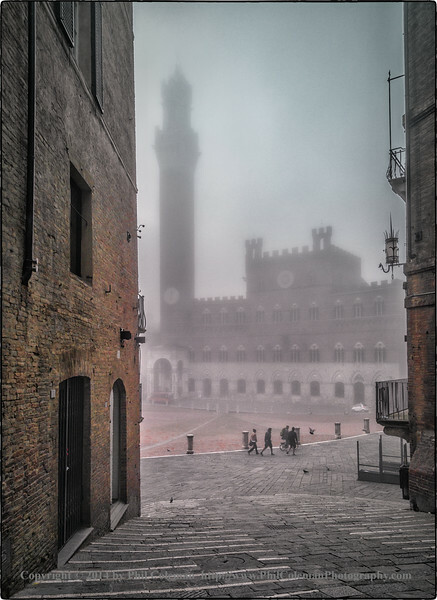 But in the spirit of the poem, I have chosen this early morning photograph of the main plaza in Siena Italy. The rising sun had not yet chased away the night's fog. The plaza, filled with people in the daytime, was quiet with just a few students making their way to early class. The stillness punctuated by the cooing of the birds, the muted colors, the ancient walls - all transported me to a place of tranquility that I felt when I clicked the shutter and that I can revive when I look at the print. My hope is that you can experience some of that too.